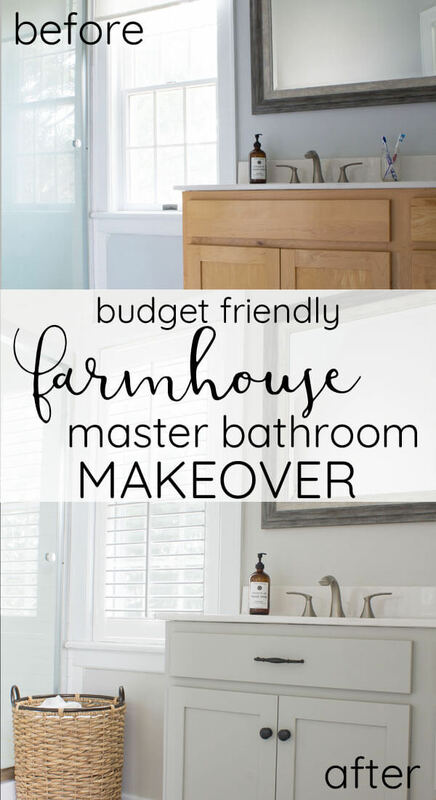 A few weeks ago I showed you the first steps of our simple farmhouse style master bathroom makeover. I'm still amazed at the difference a little paint can make. But despite the huge transformation from the fresh colors, it still needed a little something more. 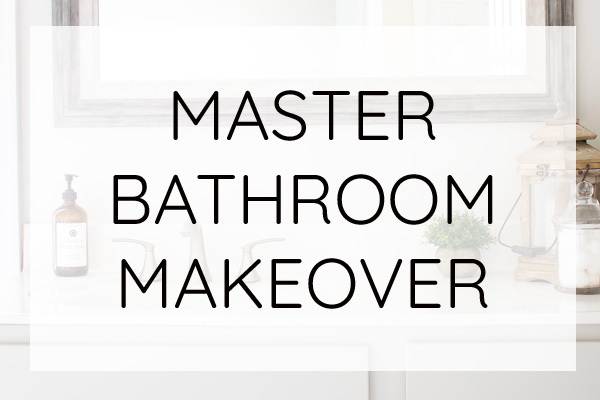 Today, I'm excited to share a few more super simple updates that totally changed the feel of our master bathroom. 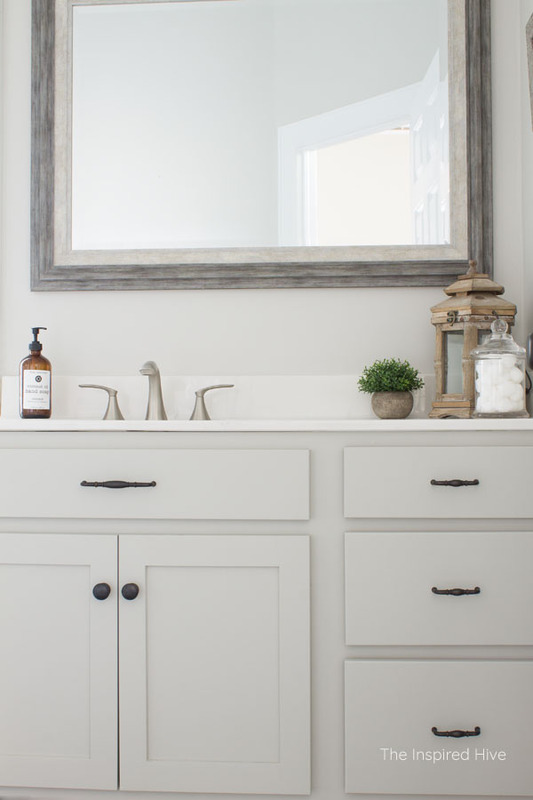 It went from ho-hum builder grade to light and refreshing farmhouse style. 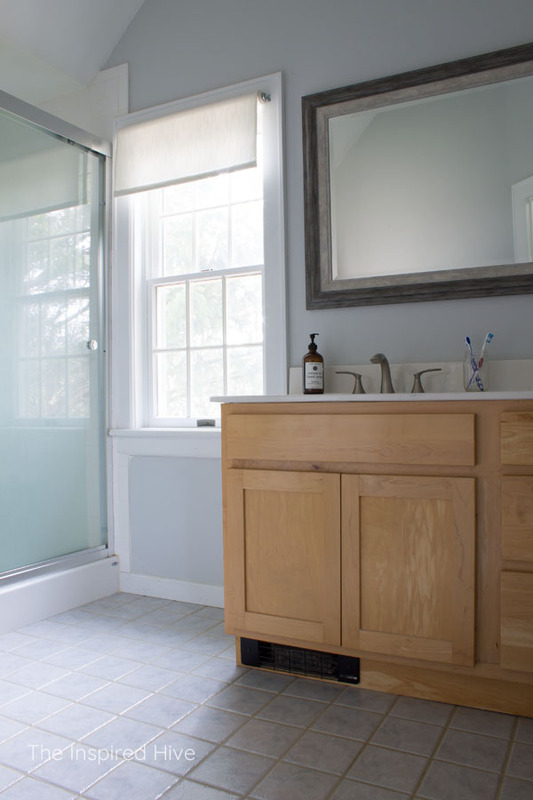 Thank you to Hickory Hardware and Blindster for providing product for this post. I only share products I love and think you'll love too! All opinions are my own. Here's a little refresher on what we started with. 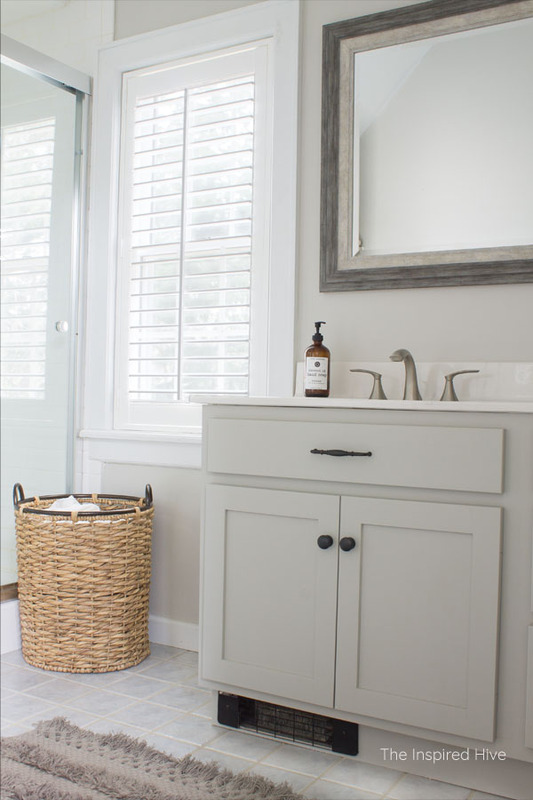 Builder grade shaker style vanity. Pretty mirror. Mind-of-its-own roller shade on the window. Modern shower. And orangey stained wood accents. None of it felt like us, but this bathroom had SO much potential. There they are, closed for the night. Ahhh. So pretty. 😍 I seriously wish I had them in the entire house now! And they're extra safe for kiddos since there aren't any cords. 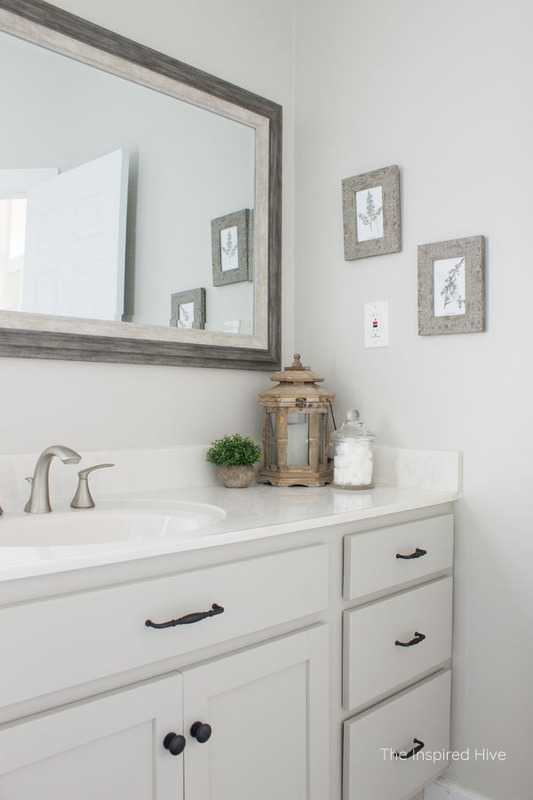 I love how they add a little Southern charm to our bathroom. I found that large basket at Hobby Lobby for 50% off and thought it would be perfect for laundry. I love how these botanical prints in rustic frames add a touch of nature to the room. 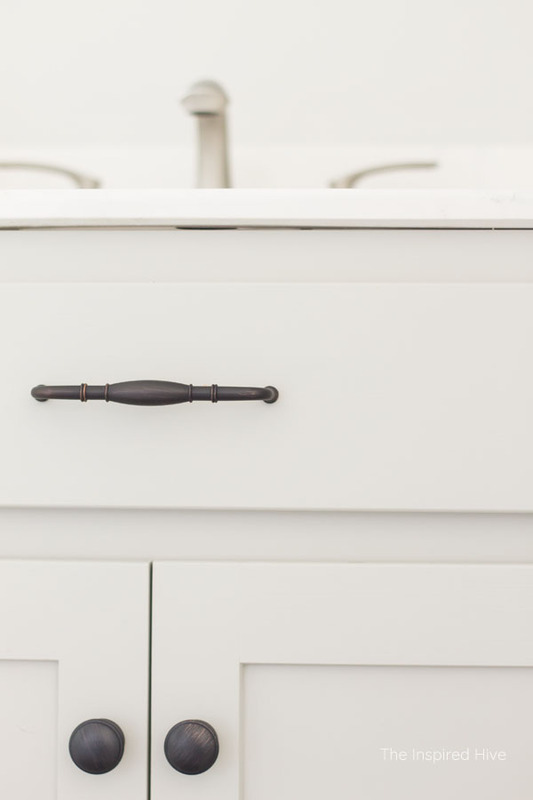 And let's not forget the beautiful new vanity hardware 😍 Updating the vanity with paint made a huge difference, but adding hardware took it to another level! 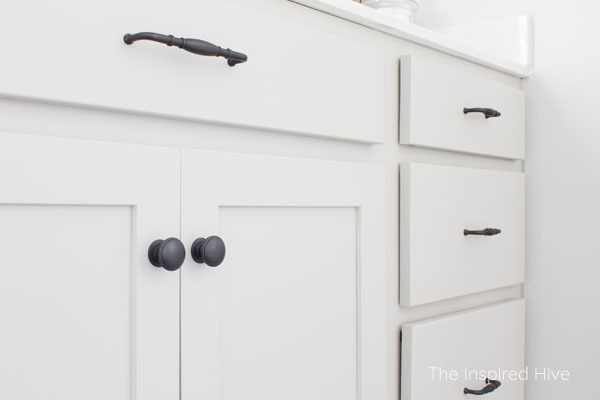 The vintage bronze Williamsburg knobs and pulls from Hickory Hardware add the contrast that the whole room was lacking. Now the room has depth and character. 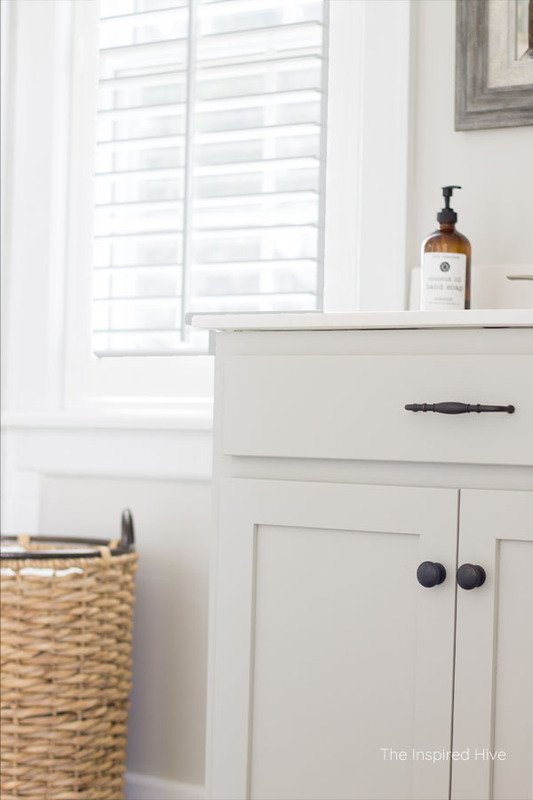 I love the details on the pulls that give the bathroom a vintage farmhouse vibe. Another small change was switching out the outlets and switches for white ones. It might seem like a silly little detail to worry about, but now that I've replaced them in two houses, I can honestly say it makes a big impact. 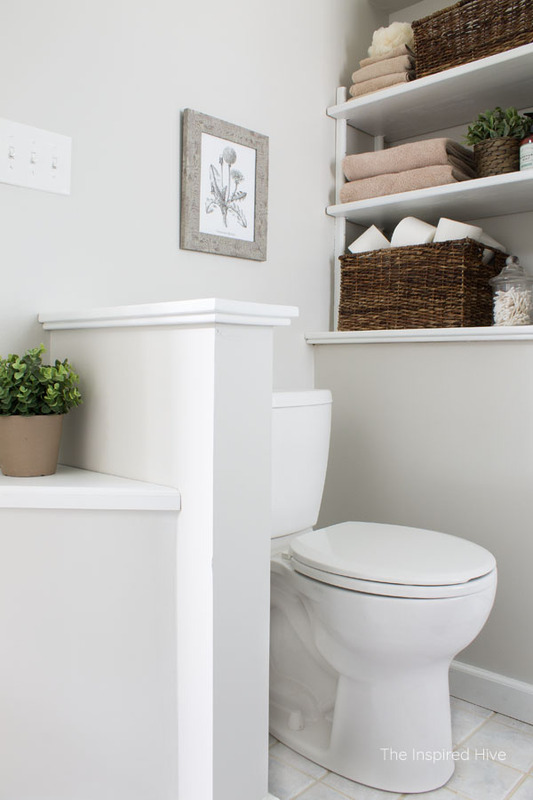 A room will suddenly feel much more modern and clean with updated outlets and switches. In the first stage, all of the shelving got a coat of white paint. Now, I've found some matching baskets to hold toiletries and toilet paper. 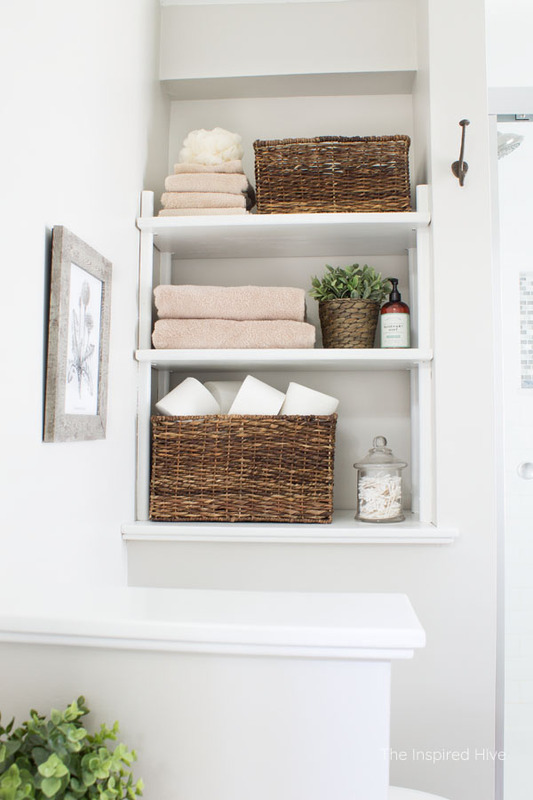 It's hard to keep bathroom shelves tidy, but having baskets can help keep the mess hidden and somewhat organized. 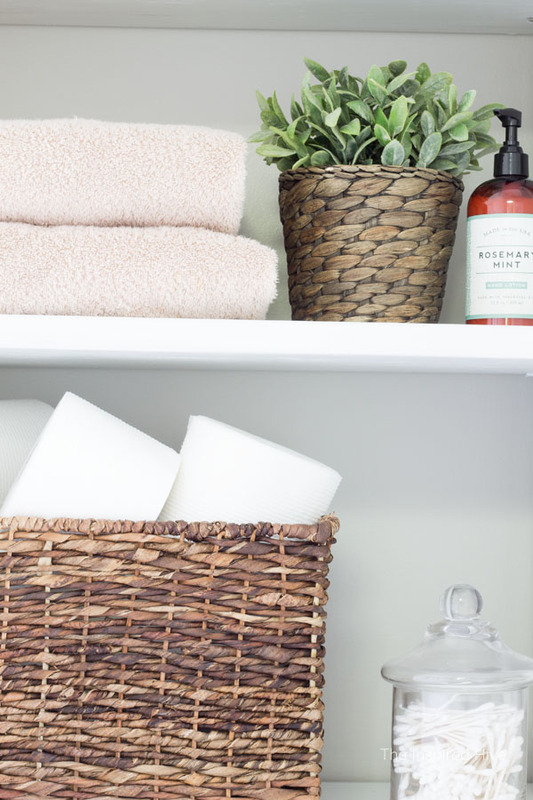 Putting commonly used items like Q-tips and cotton balls in clear apothecary style jars is a pretty way to keep them organized. 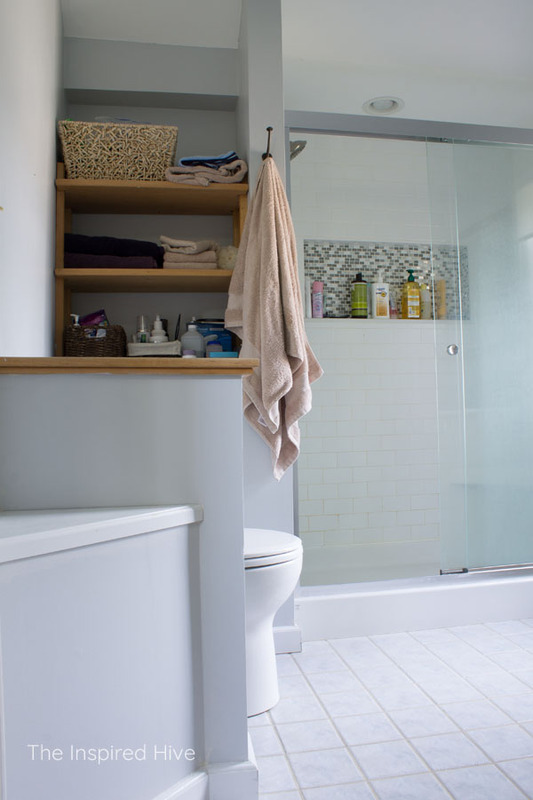 When you have limited storage space, finding stylish ways to keep toiletries on display is a must. 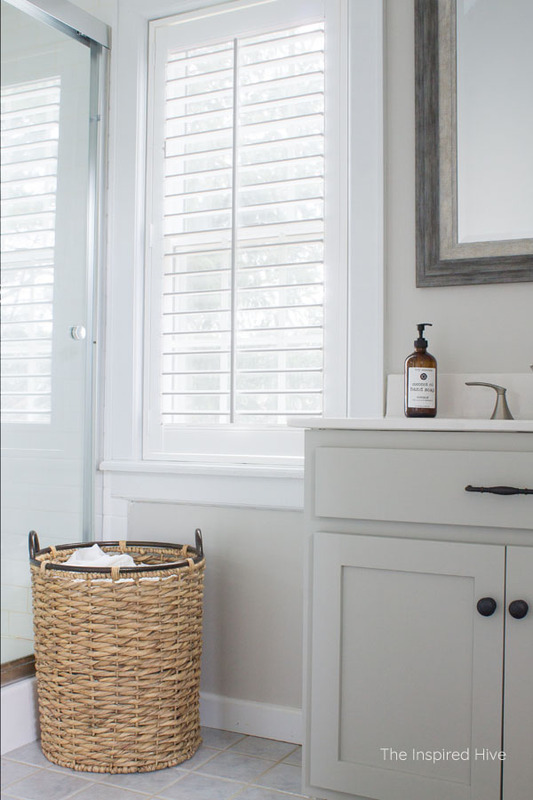 So with a little paint, new hardware, new window treatments, and a few decorative accessories, we totally transformed our master bathroom. We still have bigger plans for this bathroom down the line, but now we have a much more beautiful space in the mean time. 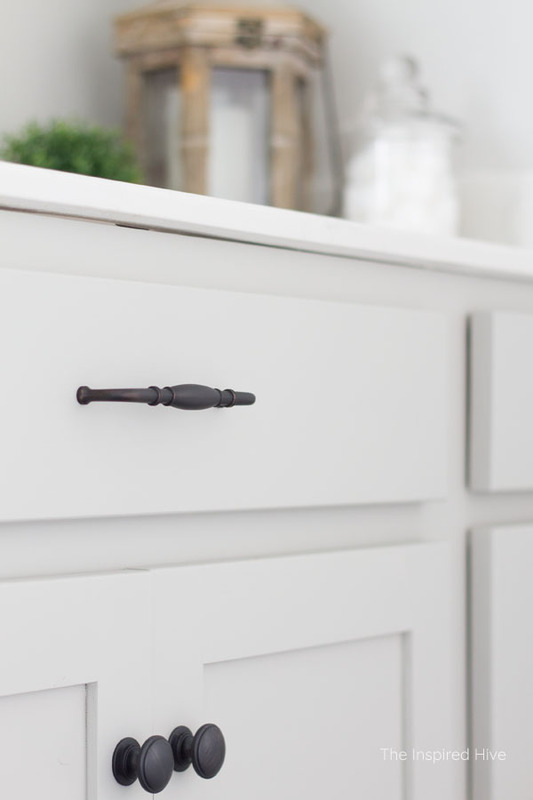 Sometimes the simplest changes make the biggest impact. Those are often my favorite type of makeovers. Overall, we've made so much progress! 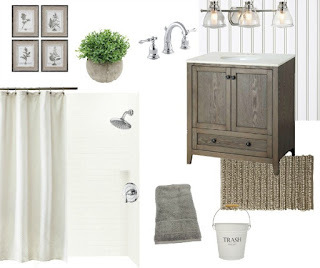 The only thing missing from phase one of the bathroom makeover to do list is a toilet paper holder 😁 But that's an easy fix! The bigger plans will happen after we tackle some other high priority projects. But for now, I am so happy with how this space turned out. It feels more like us and more like home. Like something in this space? Find it here! WOW! What a difference! LOVE the new light and bright look! Thank you SO much, Kristi! Means a lot :) We are loving the new look!